Set scene: Hubby buys expensive new dog bed. Hubby leaves house for two hours. Hubby comes home to find apologetic dog begging for forgiveness. In the middle of ten thousand bits of statically charged dog bed. Hubby spends the next half hour chasing said bits around the bedroom with a broom and dust pan. Hubby swears never to buy Elvis another bed again. 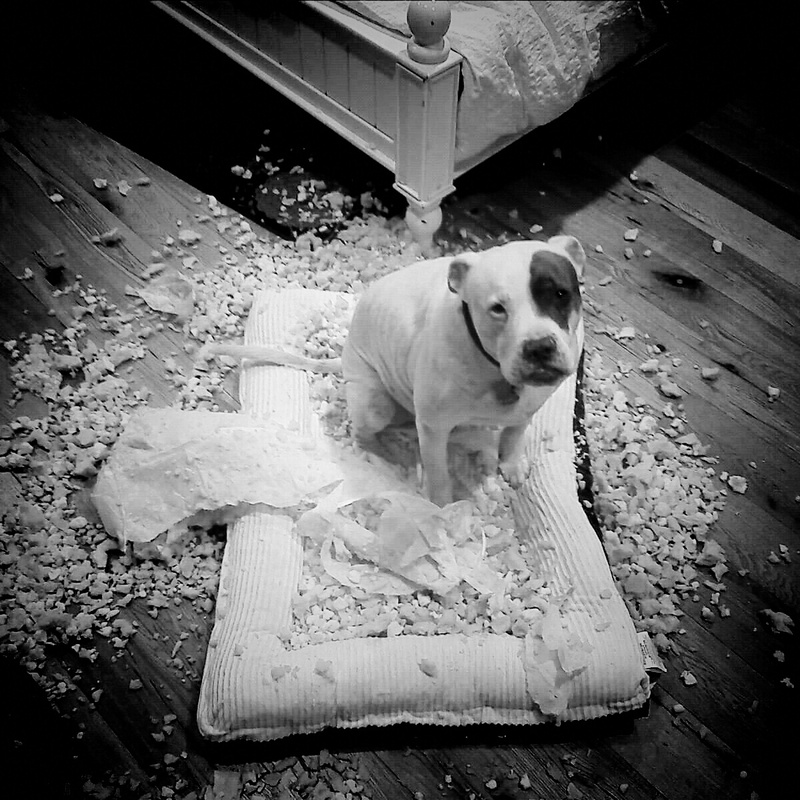 That’s what you get for buying a pit bull memory foam. The holidays are here and I’m feeling warm and fuzzy. Our post Thanksgiving tree trimming tradition is complete, and fireplace, fleece, central heating and slippers are all in simultaneous use. And so it is either the overflow of this Christmas cheer or the overheating of my brain from excessive scarf use that has caused me today to become a bit weepy and overwhelmed. In the good way. The thing that nudged me over the edge this morning is one thing that, surprisingly enough, should have come as no surprise. But the combination of post turkey food coma and aforementioned holiday spirit has suddenly directed my attention to the thing that is literally right under my nose every single morning of my life. In the dreamy five o’clock hour when I am never completely asleep or awake – my subconscious warily anticipating 6:20 when my boys come charging down the hallway each morning – an event occurs that usually ends up forgotten along with most other ambrosial hour dreams. Before tiptoeing out of the bedroom in his steel toe boots, my husband has a habit of planting a kiss on the small piece of my forehead that peeks out from under the covers. And in that brief waking moment each morning, I roll over into his warm spot, and the teenager within celebrates a small victory with the knowledge that even though I’ll be up cooking breakfast and packing lunches in less than half an hour, at least for now I can revel in the comfort of our toasty bed while he braves the cold on behalf of the rest of us. But aside from the (mostly) unconscious competitive win I claim each morning, the truth is that I have never actually realized how much this moment should mean to me. Not until today. And now it’s suddenly all I can think about. Because I am the lucky one, the recipient of spontaneous flower bouquets, I love you’s, and even a shiny tin snowman (for variety, he said). These things do mean so much, yet it’s this sweet passing second that’s really moved me today. Moved me to tears. That and I’m P.M.S.ing. So for all I was grateful for last week, here I am on the first of December finding yet one more thing to add to that list. One thing that I’m making a point to never again forget. Soft as baby’s bottom. No, really. After a typical witching hour spat between brothers, I sent them to their respective corners (er, bedrooms) to cool off, color a picture, make a puzzle, make a mess, whatever. Anything was fine with me as long as it wasn’t happening between my knife and the boiling pot on the stove. After a reasonable amount of time big brother re-entered the kitchen more level headed than when he had left. Another few minutes passed. Quiet minutes. Eerily peaceful and productive minutes. I knew something was up. And so did my mom (…my dear sweet angel of a helpful mom), who wondered aloud as to whether or not I had seen little brother emerge from his ‘thinking time’ retreat. No, I hadn’t. But I had gone over the mental list of accessible household dangers and concluded that nothing of great consequence could possibly have unfolded in the time that had passed with the items at his disposal. Responsible Grammy proceeded to call down the hallway, peek into his bedroom, his bathroom, the playroom, the living room – and finally into MY bathroom. She re-entered the kitchen less level headed than when she had left. Due to the laughter that she was holding back. And the tears. With raw chicken in one hand and a camera in the other I tiptoed into my bathroom to find two – count ’em TWO – brand new, now empty, jars of body cream rolling like wounded soldiers on the floor. And one grinning toddler giving himself the most luxurious skin treatment I’ve ever seen. And I’ve had a lot of skin treatments. None, however, have given me nearly as much pleasure as the one I was witnessing with both joy and terror. Cream, glorious cream, was everywhere. EVERYWHERE. In every fold, every crack, every nook and cranny of both my son’s pudgy body and the heretofore well kept bathroom. And now that I’m four hundred words into this post, I might as well let a picture speak for the next thousand words I’d like to write about the situation. This here is glee people. Pure, absolute glee.